Two purebred doelings out of ROC Ozymandias will be available later this winter/early spring. A purebred buckling out of AFK Sir Tommy will be available later this winter/early spring. At barely three days old this guy is already trying to breed his sisters! Two NZ bucklings out of AFK Sir Tommy will be available later this winter/early spring. 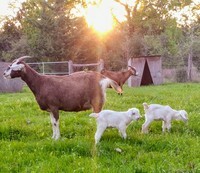 Goliad had twins. The buckling will be available later this spring.